Grandad Science: Ever get an itch to create? Scratch it! Ever get an itch to create? Scratch it! Do you know what your kids or grandkids are doing with computers at school? Our two oldest grandkids, Joshua and Jordann, go to a private school and, according to their dad (an IT professional), they are learning keyboarding and PowerPoint. The school staff seems happy providing such an unimaginative computer curriculum and probably think they are doing the right thing but the kids are not getting the best computer instruction available. Summer vacation is here and Joshua and Jordann will spend a week or two with us. Along with a trip to the mountains, water-gun fights, 3D movies, and building a wood project, I plan to introduce them to Scratch, the free and easy to use programming language designed for kids ages 8 and up. Watch this short video, an Introduction to Scratch, in which I describe the basic elements of a Scratch project. As a parent or grandparent, you don't have to learn how to use Scratch. Just point your kids or grandkids to http://scratch.mit.edu, have them download the Windows or Macintosh version of Scratch, and let the Scratch community tutor the kids. Also, support their efforts by patiently watching their Scratch projects and making the appropriate comments. In the future, I will be posting short Scratch tutorial videos. In the videos I will be connecting Scratch to mathematics and science. Scratch is especially good for exercising algorithmic thinking (algorithm is another name for script). Algorithmic thinking includes algebraic thinking so most of the pre-algebra and algebra topics kids are struggling with are quickly and easily learned using Scratch. And Scratch gives kids the opportunity to apply those concepts. Since I don't yet have any of the kid's Scratch projects to show you, I created the following project to illustrate more of the features built-into Scratch. I then follow the video with a brief description of the geometry and probability concepts used in the project. The turtle is using differential geometry to draw the circles (actually polygons). The Scratch script instructs the turtle to ‘move forward a little and turn right a little’. This creates a polygon with such short sides the polygon is indistinguishable from a circle. 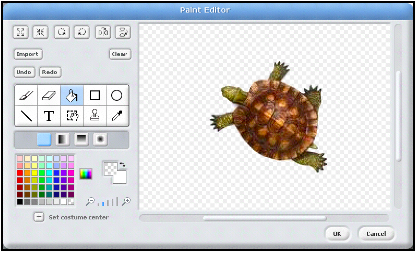 The turtle carries a paintbrush that can be either up or down. The width of the paintbrush is determined by rolling dice (calling a random number) and the color of the brush is also set by calling a random color number. The music track is from a built-in library of sounds but you can record your own sounds or use your own music tracks. 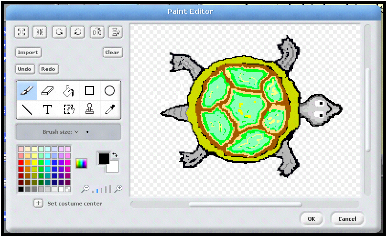 For the demo, I wanted a top-down view of a turtle so I Googled ‘turtle top view’ under images and imported into the Scratch Paint Editor the turtle image shown in the following photo. Kids love the Paint editor. The turtle image can be used as a sprite as-is but I used the Google image as a pattern and painted over it (paint tools in the lower-left corner) to make the turtle shown in this photo. To finish the project, I snapped together the instruction blocks needed to make a motion script and a sound script. Clicking on the green flag tells the turtle to run both scripts at the same time. Grandadscience loves Scratch. I've uploaded to the Scratch web site several other projects. To view them, go to http://scratch.mit.edu/ and Search on 'popswilson'. See you and your kids on Scratch.